In this blog we will learn how to integrate Spring with a Struts 2 and Hibernate project. 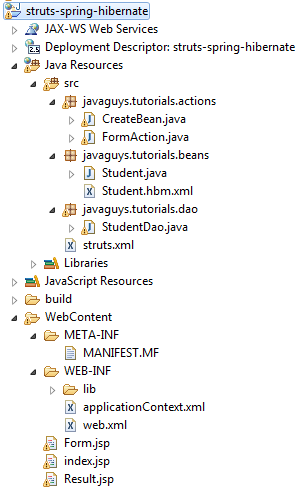 This blog will guide you through step by step integration of spring in a struts and hibernate web application. Here is a snapshot for overall project structure in eclipse IDE. Create a package structure as shown here and add required files and libraries as per the later part of this blog. be sure that a correct set of libraries are added to lib folder. Open mysql workbench and run following script to make a test database for our application. In this particular application we are taking a student_data table that would be mapped by an java object using hibernate mappings and configuration. web.xml is the starting point for every java web application ,it tells the container about project flow and request-response cycle. We have added a struts 2 filter with /* mapping, it tells the container that all upcoming requests are going to be served by struts 2 itself. Later on we have added a context loader class and given the path of applicationContext.xml file. 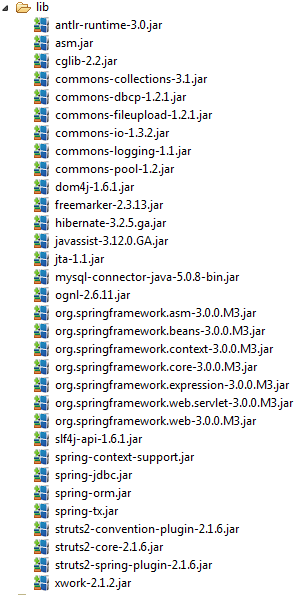 applicationContext.xml is the core of spring and it is used to configure all spring side of work flow. Our hello world application starts with a welcome file named index.jsp. Here we have added a struts-tags tag library that makes it easy to generate html response dynamically. This page shows up a hyperlink, in href attribute we have used a struts url tag it makes the link to call a action named formAction. Struts 2 provides a effective tag libraries support that can be used to create a dynamic html content. This page shows a form with some input fields, on submit createBean action is called and form data is moved to createBean action. In Struts 2 all action mappings and configuration goes into a xml file called struts.xml. Which action is going to serve the request and what jsp is to be rendered is decided in struts.xml using xml configurations. Using spring we can eliminate the use of Hibernate configuration file hibernate.cfg.xml by adding database url and username-passsword in applicationContext.xml. In struts 2 actions can be represented using a simple class so called pojo(plain old java object) , struts 2 provides some useful classes to be optionally extended in a action class so that some common features as form validation can be implemented easily. ActionSupport class is one of them that is being extended here, but remember that extending a helper class is totally optional in struts 2. A plain java class is used as a bean to represents a unique identity in application. The objects of this class are going to be represented as a row and the fields of the class are going to represent attributes of a row in a table. Here in hibernate data is mapped from a java object to a relational database with hibernate mappings configuration. In hbm.xml hbm stands for hibernate mappings ,this file maps java objects to relational databases. Every java object represents a row and a class represents a table in database. Now we are all done with our Spring Integration with Struts 2 and Hibernate Web Application , run application on Server to see the Result . 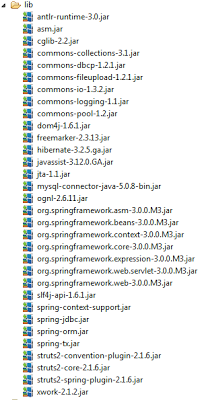 Download "Spring + Struts + Hibernate integration Example project" from "SkyDrive"